Moles are silver-grey to black in colour, around 12-15cm in length and weigh around 70-100 grams. Their fur lies in either direction so that they can move forwards and backwards through their tunnels with ease. They have sensory hairs on their heads, forefeet and tail, which allows them to pick up information from vibrations in the ground. They have spade-like front feet which are used for digging and fully-formed eyes that can distinguish light and dark. Their ears are small but their hearing is very good and helps them to find food, sense predators and other moles. They are also good swimmers. Earthworms are their main diet, but they also eat insect larvae, molluscs and other invertebrates. Moles are solitary by nature and live for the most of the time in their tunnel system. Moles are found in most of Europe except for Ireland and live in grassland, deciduous woodland areas, playing fields, parks, golf courses, and private gardens. Moles can damage land by tunnelling underneath it and causing molehills. On lawns and golf courses, the area disfigured by the molehill prevents the grass from growing and allows weeds to grow. Where they have been digging under crops it can cause some of the crop to die or have its growth stunted. The mole will live for approximately three years and the breeding season is between February and June. 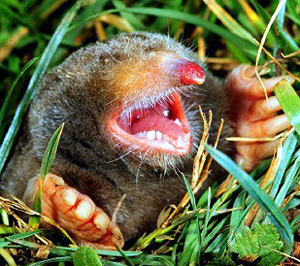 The mole only has one litter of young a year and the gestation period is four weeks. The litter of young is between two and seven and the young are born blind and without fur. The mother feeds them for four to five weeks after that they leave the nest to fend for themselves and soon after that they will make a home of their own. Moles do not hibernate and are active all year round. Various repellent devices are available and have varying degrees of effectiveness in eradicating moles. Moles can be trapped but specialist traps have to be used. The use of traps is time consuming and other animals and people can spring them by accident. Poisons can also be used to eradicate moles but you will need professional treatment, as there is strict legislation in force and special licences are needed to use these poisons. If you suspect you have a Mole infestation in Edinburgh, Glasgow, Aberdeen, Dundee or Perth, call GRAHAM pest control today and we could help.